A couple of weeks ago, we posted a very odd, very short entry about how things here were a bit messed up. That was, in a way, a continuation of a post from months ago…and also related to a number of other posts since then. Now, we’re at the point where we can explain what has been going on in our crazy lives. But, because of Dan’s little physics lesson last week (he’s recovering well, by the way, and thanks to everyone who has expressed concern…and no, the idiot in the car wasn’t charged), we’ve already messed up the chronological order to our posting/lives, so we’re going to tell another older story and make you wait for the resolution of our other strange tale. Last weekend, we attended another CSU winery event, similar to the Barrel Hall Dinner that we wrote about in September. This one was the Harvest Celebration, and a bit more informal than the previous event. And in some ways, not as good, though it has a lot of potential…and things we mention in this post we’ve given to them as feedback already, and they acknowledge that some better planning might have been good. First off, this one wasn’t a sit-down dinner; billed as a Mediterranean barbecue, we didn’t actually know that there was no seating, and no full meal. Instead, our group of 6 managed to find a barrel to sit our drinks on and use as a table, and we stood for about 4 hours outside the barrel hall. Yes, outside in Australia in May…it got a bit chilly! Our barrel was beside a fire, but not a great fire. Anyone who grew up using wood for heat, as Dan did, knows you need coals not flames. 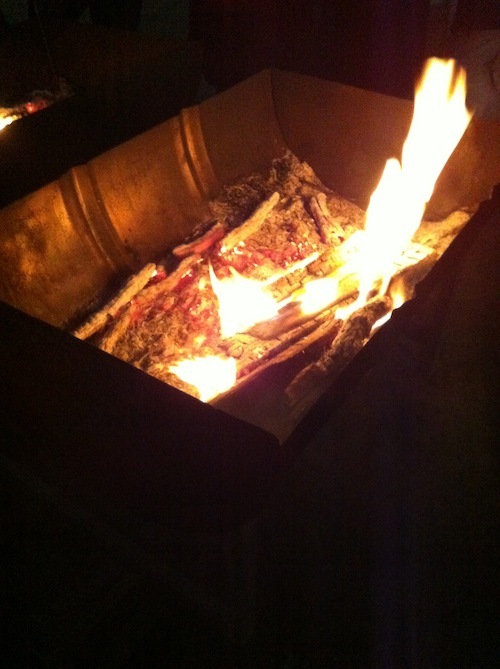 Grape vines don’t make coals – this fire could have used a good big red gum log. The cellar door manager did say to us later that she didn’t think the fires were good enough – the person in charge of that wasn’t really up on how to have a good fire, so instead of having big blocks of wood that throw a lot of heat, they were burning grape vines that had been pruned. Kind of cool…in more ways than one. They didn’t do a great job of keeping us warm on the 9 degree evening – but they did smoke the hell out of us all evening. If we had known, we would have dressed more appropriately. And the other problem with the temperature was that it didn’t help to showcase the wines very well. All the wines we were served were new releases. There was a new sparkling wine, a chardonnay, a grenache, a petit verdot, a cab/merlot blend, and also we had a sample of a yet-to-be bottled cabernet. And serving the reds at this temperature didn’t allow their full flavour to come out. 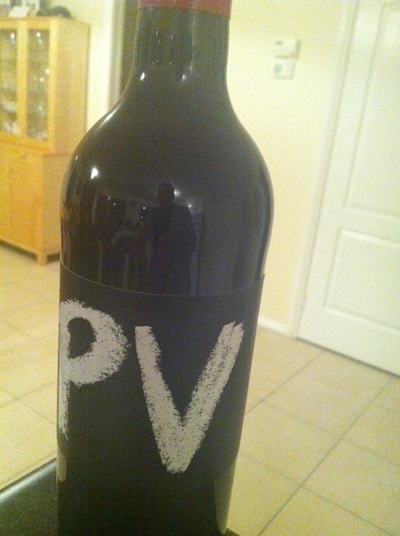 We ended up buying a case of the petit verdot (love that staff discount!) and will probably buy the grenache when it becomes available even though we don’t know what they really taste like. This might be partly because of the cold and partly because both were served late in the event, and they don’t hold back on the wine! But both are also worth trying and are limited quantities…can’t remember exactly how much, but it was something like 100 cases of each produced. The CSU petit verdot uses the new ‘initial’ labeling that started with the M (for merlot) an T (for tempranillo) last year. It is very good: thick, inky, cocoa-y…you need to brush your teeth well after a glass of this! Foodwise, again, was hit and miss. We were expecting a sit-down meal but instead got served finger foods. And while most of them were good – arancini balls were spectacular, as were the lamb kofta – there wasn’t a lot of it. And the pacing was a bit off at times, so we would go for long periods with no food. And a couple of items, such as a gazpacho shooter (which we later learned was very expensive…not a good idea) was kind of ho-hum. But again, they just kept pouring wine…every time you looked, there would be someone with a bottle or two, offering to fill your glass. So overall, it was a pretty fun evening and definitely worth the money. Next day, however, we had to deal with the residual smoke! Our clothes and hair and bodies reeked of burnt grape vine – Dan’s jacket is still hanging on the door, trying to air out. And our sheets and pillowcases…well, good thing it was laundry day. And it was a good thing it was a Sunday too – a lot of wine was consumed the night before! This entry was posted in barbecue, CSU, food, wine, wineries. Bookmark the permalink.